Giraffes are a funny and gangly wild animal that intrigues all young children. Add this delightful critter to your paper plate zoo collection. Imagine a paper plate to be the animal's head. What do you need to decorate the paper plate with to make it more look like the animal you have in mind? The next step involves cutting out head parts that need to be painted the same color as the head. For most animals, this will involve cutting out a pair of ears out of construction paper or cardboard. With the paper plate's right side up, glue the pair of ears on either side of the plate. Allow the glue to dry. If your animal has other parts that need to be glued on, flip the paper plate over so that the bottom side is facing up, before gluing head parts. Remember to position the paper plate bottom side up with the ears glued at the back. Paint the animal with any water-based paint. Paint on some stripes if your animal has these patterns. You can finger paint or use a paint brush. If you want to try something new, you can make your own potato stamps or fruit and vegetable stamps to make the animal patterns. After you're done painting, allow the paint to dry completely. When the paint has dried, you can add the remaining facial features. To make the eyes, you can glue on wiggle eyes, buttons or paper cut-outs. For a lot of animals, you can simply draw or paint on the nose and mouth. Some animals like this giraffe, have snouts. 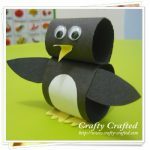 To make a snout, cut out an oval shape from construction paper and draw the animal's nostrils and mouth on it. You can use crayons, oil pastels, colored pencils or markers for drawing. Glue the snout onto to the paper plate head. To make the animal's head a little less round, position the snout so that it protrudes a little bit along the bottom of the plate. You can do this with long-faced animals such as giraffes, horses, cows or goats. You can add additional details if you like. 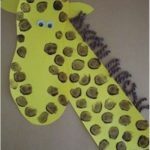 This giraffe needs a pair of horns and I made them by cutting a craft stick in half and gluing them at the back of the paper plate. The craft sticks can be colored or painted before gluing on circles out of construction paper at the tips of the horns.